Vineyards: A rather complex blend of three Merlot vineyards plus a dash of Petit Verdot. All our soils on Devon Crest are deep and well drained with a high clay content. Vines receive supplementary irrigation if we have water. Average yield 7 tons/ha. Winemaking: Fermented with natural yeasts, made in classic low intervention manner, no extended skin maceration. One third kept on the lees in tank, the rest aged 24 months in second, third and fourth fill French oak barrels, racked at intervals as necessary. Polished with a light (half an egg per 100 litres) fining and a coarse filtration. Comments: Meinert Merlot in its classic elegant smooth style. Drink from release in late 2016 to 2020. Fresh, rich brick red colour. Dried herbs and ripe berries, quite a heady nose, no doubt it will settle some more. A gentle wine with a soft round middle and a firm crisp finish. Ideal to enjoy with game birds like quail, guinea fowl and duck. Lamb suits the wine’s herbal touches. 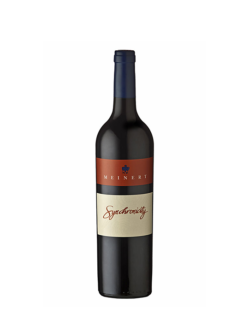 This blend is made of Merlot (85%) and a dash of Cabernet Sauvignon (15%). 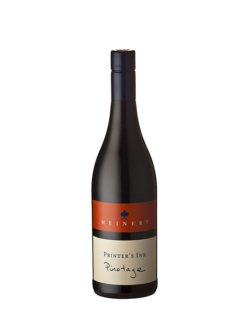 This blend is made of 87% Merlot, a dash of Cabernet Sauvignon (9%) and Cabernet franc (4%). A mix of 88% Merlot and 12% Cabernet Sauvignon.